Metin Doğan lies before a tank on July 15, 2016. 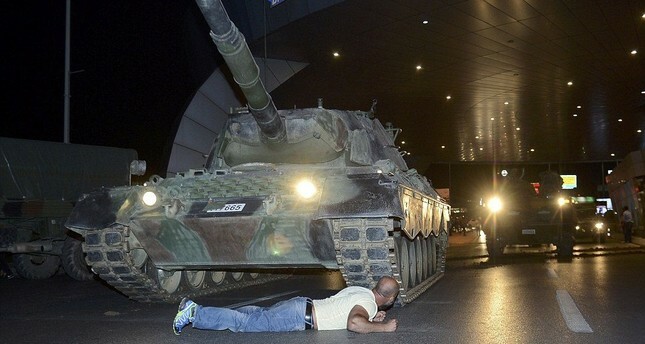 Metin Doğan, who is regarded as one of the heroes of the fight against the 2016 coup attempt, recounted how he felt the night he laid down in front of a moving tank outside Istanbul's Atatürk Airport. Doğan survived as the tank halted at the last minute but the putschists killed 250 people across Turkey on July 15, 2016. One hundred and fifty nine defendants are on trial at an Istanbul court for the attempt which is blamed on military infiltrators of the Gülenist Terror Group (FETÖ). Defendants are accused of the takeover of the airport and killing two people in the process. Doğan and others, including a 16-year-old killed by putschists, were there as civilians simply seeking to convince soldiers to lay down their arms. Telling the court what he did that night, the witness and plaintiff Metin Doğan said he wouldn't file a complaint against the conscript who was commanding the tank and accused the soldier's commanders of the coup attempt. "I was there to light a fuse, a fuse of resistance," said Doğan, who has commonly been called "Tank Man" after his iconic image made the headlines. "I wanted the tank to crush on me so that people would come there and would react [to the putschists]," he told the court. "When the tank stopped, I stood up and I saw three soldiers. One was shouting he would fire and I told him 'f... you if you don't.' They drove the tank again and I laid on the ground again. I felt its tread touching on my head but then it stopped again. I heard the ground was shaking and when I stood up again, I saw a crowd surrounding the tank. I thought I finally made it and incited people [to take action against the putschists]," he said.The coup attempt was quelled thanks to strong public resistance after the country's leaders called on people to take to the streets "to reclaim democracy." Speaking during a break in the hearing, Doğan told Anadolu Agency (AA) he believed that the defendants were more "guilty" when he saw them in the courtroom. "They look happy and smile. They are neatly shaven and dressed well. They would be a mess if they thought they were not guilty. They wouldn't eat or drink and care for themselves if they were worried for their actions," said Doğan.